Standout Tidbits: PBR for HAPPY HOUR! Wyman’s is right next to Lik’s Ice Cream (formerly Lickety Split) at 13th and Vine. Review: Wyman’s No. 5 is a neighborhood tavern-type establishment located just east of the Capitol Hill neighborhood (and north of Cheeseman Park) in Denver. The decor is dark hardwoods, pool tables, a few stained-glass windows, and several TV’s showing various sporting events. 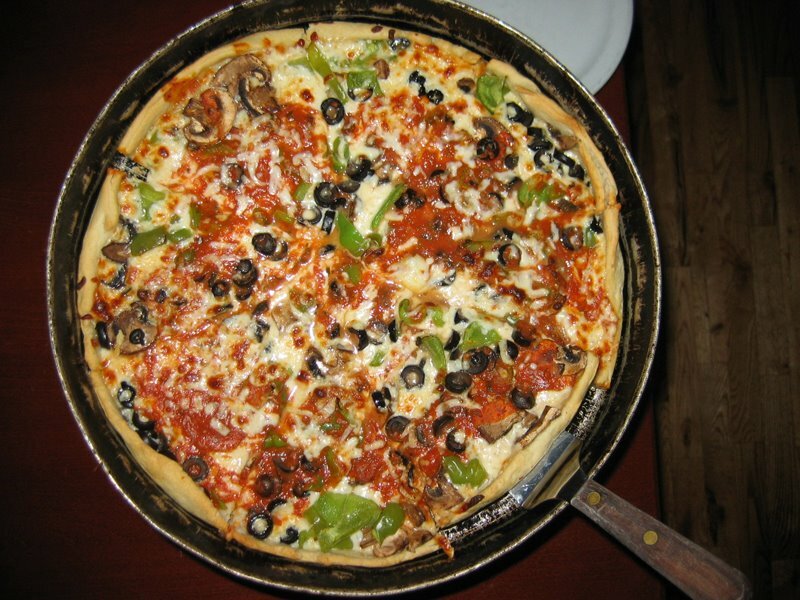 The simple menu offers up whole “Chicago Style Pies”. In addition to build-your-own options with either red or spinach pesto sauce, there are a series of specialty pies with names like “The Tree Hugger” (pesto & veggies), “The Phat Brando”, and the “Dazed & Confused”. The menu I saw (and brought home for reference) is just one sheet and didn’t even list a salad or dessert. But hey! It’s a bar. The staff, or at least the bartender who took our order and brought our beers and pizza, was very pleasant. He even joined in our pie-related conversation when he asked why we were taking pictures of the food. This was a pretty good tasting pan pizza, but the construction of it reminded me of a regular pan pie, like you would find at Pizza Hut (but tasted far superior). It had a very flavorful, moderately-seasoned sauce, yet, it wasn’t quite as chunky with pieces of tomatoes as I normally expect from a Chicago pie. There was a healthy amount of good mozzarella. The main issues I have are with the deepness of the crust and the amount of toppings. The base and sides of the crust were only slightly thicker than that of a tradtional thin crust. This allowed for a “lip” around the edge of the pie that hardly stood above the other ingredients. The amount of toppings were adequate, but certainly not the copious layers we were anticipating. I visited Wyman’s on a Tuesday with another Zealot before we attended our weekly poker game. Our plan was to enjoy a couple $1.50 Happy Hour Pabst Blue Ribbons and get temporarily filled up on a slice or two while we warmed up our poker faces by watching the World Series of Poker. We were hoping to be savoring our leftovers during a mid-tournament break later in the evening. The proportions of this pizza were so “normal”, however, that we wound up finishing the whole thing then and there. It turned out ok, as we both got knocked out of the game and went home early. We blamed it on the cheap PBR. Please let me re-iterate, this is good bar pizza. My only issue is that, in my opinion, I think its’ style is being misrepresented. I need to make a point of going out and trying more Chicago-style pizzas, and if I find I have been in error I vow to come back and update this post. This entry was posted in Chicago-Style, Good, Pan / Deep Dish and tagged Good, Traditional Pan or Thick Crust. Bookmark the permalink.